GLI guide for the interpretation and reporting of line probe assays:: This guide has been developed to provide practical information on the interpretation of the most commonly used first- and second-line line probe assays (LPA). In addition to the interpretation of the mutations identified by the two assays, this guide includes practical recommendations on additional follow up diagnostic actions that should be performed in the presence of specific mutations and the clinical implications that these mutations have on the selection of appropriate tuberculosis treatment regimens. Additionally, the guide further illustrates individual case studies to demonstrate how information should be reported to clinicians, as well as examples of LPA results, and a recommended reporting template. Available in English, French and Russian. 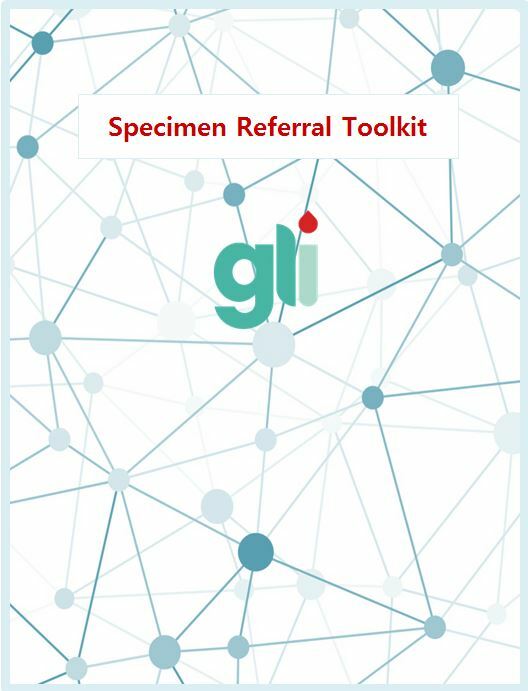 GLI Specimen Referral Toolkit: Building on the GLI Guide to TB Specimen Referral Systems and Integrated Networks, this toolkit not only underpins the essential components that must be considered when establishing or improving laboratory networks, but provides specific tools and materials available to all stakeholders working towards the optimization specimen referral networks. This Specimen Referral Toolkit contains examples of existing tools in use by countries and, newly developed tools which have been created to fill gaps in existing materials. All of the tools in the Toolkit are presented either by helpful tools for phases of developing or strengthening a specimen referral system, or by component of the system. GLI Guide to TB Specimen Referral Systems and Integrated Networks: This guide describes the various phases to create and strengthen specimen referral systems, essential components involved in referral, as well as other considerations for TB programme and laboratory managers, Ministry of Health officials, and other stakeholders across disease programmes. In addition to describing transport mechanisms and equipment required to move specimens in a safe manner, this guide also provides information on logistics, results reporting, data management, monitoring and evaluation, and standard operating procedures that will facilitate and improve specimen referral systems. GLI Planning for country transition to Xpert MTB/RIF Ultra Cartridges: this guide provides practical guidance to develop an actionable implementation plan to smoothly transition to use of Xpert MTB/RIF Ultra cartridges, ensuring uninterrupted service and avoiding cartridge wastage. Topics covered in the guide include adapting national guidelines and diagnostic algorithms; managing existing cartridge supply, forecasting, procurement and distribution; planning site-level computer software upgrades and trainings of laboratory personnel and clinicians; ensuring coordination among donors and partners supporting Xpert implementation in countries; and monitoring impact of the roll-out of Xpert MTB/RIF Ultra. GLI Practical Guide to TB Laboratory Strengthening: This guide provides practical guidance on implementation of WHO recommendations and international best practices for TB laboratory strengthening. It is an updated version of the GLI Guide for Providing Technical Support to TB Laboratories, providing the latest practical guidance on use of newly recommended diagnostics in model algorithms, as well as guidance in key technical areas, including quality assurance and quality management systems, specimen collection and registration, procurement and supply-chain management, diagnostics connectivity, biosafety, data management, human resources, strategic planning and other topics. Providers of technical assistance may also use the guide as a reference for available resources and tools. GLI Model TB Diagnostic Algorithms: This handbook provides 4 model algorithms that graphically depict the most up-to-date WHO recommendations on use of TB diagnostics. The algorithms follow the principles of the End TB Strategy to provide universal access to rapid testing for Mycobacterium tuberculosis complex bacteria and drug susceptibility testing, and include the use of Xpert MTB/RIF, line probe assays for 2nd line drugs, the lateral flow urine lipoarabinomannan (LF-LAM) assay and the loop-mediated isothermal amplification (TB-LAMP) test, together with conventional tools including microscopy and phenotypic culture and drug susceptibility testing. Available in English, French and Portuguese. Framework of indicators and targets for laboratory strengthening under the End TB Strategy: This Framework, developed as a collaboration between the WHO Global TB Programme and the GLI core group, comprises 12 core indicators that measure countries’ capacity to detect TB accurately and rapidly using new diagnostics, provide universal DST, and ensure the quality of testing. The Framework serves as a guide for all countries developing plans for laboratory strengthening during 2016-2025, and also provides methods for calculating country-specific targets for the numbers of tests and facilities needed for each of the main diagnostic technologies. GLI Information Notes on WHO-recommended TB diagnostics: GLI periodically develops Information Notes to provide practical guidance to countries and partners on implementation considerations on use of WHO-recommended diagnostics. Laboratory Diagnosis of Tuberculosis by Sputum Microscopy - The GLI Handbook: Guidelines for sputum smear microscopy have been published by WHO and The Union, but in the decade since publication, many developments have occurred and a revised and updated text replacing both was considered timely. The GLI Handbook is a practical guide for the laboratory technician; it draws on the ideas outlines above and references best practice documents released by WHO and the GLI. The Handbook uses simple text and clear illustrations to assist laboratory staff in understanding the important issues involved in conducting sputum smear microscopy for the diagnosis of TB. GLI TB Microscopy Network Accreditation: an Assessment Tool: Although there are many international guidelines and technical materials for procedures and EQA, there is little or no external validation to assure that countries are adequately managing the microscopy networks. This accreditation tool is based on the many WHO-approved guidelines that provide technical direction, recommendations and specific forms to document and monitor performance of microscopy networks. The tool is composed of eleven standards with each a corresponding measure defining the minimum allowable performance to achieve accreditation. GLI Stepwise Process towards TB Laboratory Accreditation: One of the best methods of laboratory strengthening is to implement a quality management system complying with the requirements of the international quality standard for medical laboratories, ISO 15189:2011. This website provides a stepwise plan to guide TB laboratories towards ISO 15189 accreditation. It was developed by the Royal Tropical Institute in cooperation with partners from the Centers for Disease Control and Prevention (CDC), The International Union Against TB and Lung Diseases and the KNCV Tuberculosis Foundation. The structure and contents of the tool are the result of two consensus meeting held at WHO headquarters in 2011. GLI/NDWG Meeting report on high-priority target product profiles for new TB diagnostics: Diagnostic manufacturers are increasingly expressing the need to be informed about the type of TB diagnostics they should invest in, as well as the potential market size for these products. The development of target product profiles (TPPs) is therefore an important step to align the needs of end-users with the specifications and targets that product developers should meet in terms of the performance and operational characteristics of such tests. Consensus on the minimal and optimal specifications of four different types of TB diagnostic tests has been reached following a meeting convened by WHO on behalf of GLI and the New Diagnostics Working Group. GLI Mycobacteriology Laboratory manual: This document describes standardized procedures related to sputum collection, handling, analyses, and reporting, with a focus on testing that has the greatest impact on microbiology endpoints for MDR-TB clinical trials (sputum culture conversion in liquid and solid media). GLI Practical Handbook for National TB Laboratory Strategic Plan Development: This handbook is designed to guide simplified steps for national TB control programmes to develop a TB-specific national laboratory strategic plan. Accompanying the handbook is a Facilitator’s Manual and Participant’s Manual. GLI Ventilated Workstation Manual for AFB Smear Microscopy: Laboratories performing AFB smear microscopy as well as Xpert MTB/RIF require adequate ventilation to minimize the occupational risk of infection. However, this is difficult to achieve in many settings where facilities have limited airflow, and where commercially produced biosafety cabinets are not affordable or appropriate. This guide provides specifications for the manufacture of a ventilated workstation that has been validated.